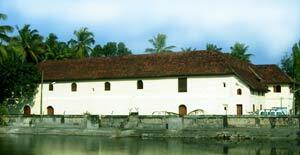 Also known as Dutch Palace, the Mattancherry palace with its medieval charm is situated at Palace Road, Mattancherry,10km from Ernakulam city, Kochi, Kerala. Built by the Portuguese and presented to the Raja of Kochi Veera Kerala Varma (1537-65) in 1555 AD, it took on its present popular name 'Dutch Palace' after 1663, when the Dutch carried out some extensions and renovations in the palace. The rajas also made more improvements to it. Today, it is a portrait gallery of the Cochin Rajas and notable for some of the best mythological murals in India, which are in the best traditions of Hindu Temple Art. The entrance to the Mattancherry Palace compound is through two arches which are typically Portuguese in character and a flight of steps through a portico on the south, gives access to a suite of public rooms on the upper level of the palace. The Palace with two floors built around a central courtyard follows the traditional Kerala style of architecture known as 'nalukettus'. From the outside, the palace looks European in character with scraped masonry walls and round-headed windows and doors but its sloping tiled roof and wooden balconies are indigenous features. Inside the inner court, there stands a small temple dedicated to 'Pazhayannur Bhagavati', the protective goddess of the Kochi Royal family. Two more temples are situated on either side of the Palace dedicated to Lord Krishna and Lord Siva. The palace, with the interiors panelled with wood has exhibits of the Rajas of Kochi like ceremonial robes, headdresses, weapons, palanquins, furniture but the main feature is the series of astonishing murals, depicting scenes from the Ramayana, the Mahabharata, and the Puranic legends connected with Shiva, Vishnu, Krishna, Kumara, and Durga painted on the walls as well as the portraits of the rajas. The paintings cover a wide range of themes from the 'Puthra Kameshti Yagam' to Rama's return to Ayodya after vanquishing King Ravana of Lanka. The paintings totally cover nearly 1000 sq.ft in area and date from early as the 16th century through mid nineteenth century and are found in the bedchambers on the west side of the palace, in four chambers upstairs, and in two low ceiling rooms that are entered by a steep stairway. 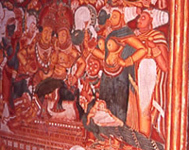 These beautiful and extensive paintings are fine examples of Kerala mural paintings best known for its unique style than the technique.